This memo explains the vegetable and fruit requirements in the Child and Adult Care Food Program (CACFP) and includes Questions and Answers. This revision amends the policy for crediting mixtures of vegetables and fruits to allow them to count towards both the vegetable component and the fruit component if the quantity of each is known (covered in the Question and Answers section). This memo extends to the At-Risk afterschool component of the CACFP the flexibility to take one vegetable, fruit, or grain item offsite to eat at a later time. The food item a child takes offsite must be from the child’s own meal or snack, or left on a share table by another child who did not want it. CACFP At-risk afterschool organizations must ensure that allowing food items to be taken offsite is in compliance with local and State health and safety codes. This memo supersedes CACFP 22-2016: Taking Food Components off site in the At-Risk Afterschool Component of the Child and Adult Care Food Program, August 10, 2016. USDA guidance memos are posted on the USDA CACFP policy website. Food Production Record forms have been revised to comply with the new meal pattern and a new CACFP Creditable Cereals Worksheet were posted in Download Forms earlier this month. The serving sizes for each age group must be communicated in writing to staff responsible for serving meals and included on food production records, menus, and/or another document as part of your monthly CACFP records. Links are listed below (click on underlined form ID). The CACFP Creditable Cereals Worksheet (CACFP MP27) is new and was posted 4/28/2017. Follow the instructions on the worksheet to determine if a cereal meets the new CACFP limit of sugar per serving. To find forms when you don’t have a link, click control F and enter a search word. 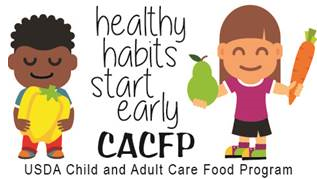 If you wish to implement the new meal pattern before 10/1/2017 and haven’t done so already, submit form CACFPMP024 to your consultant or the State Agency for approval. The CACFP Administrative Manual has been revised to comply with the new meal pattern, procurement requirements and other current USDA guidance. Chapters 1-10 will soon be posted in Download Forms, followed by the Appendices. A hard copy will be mailed to each organization when the manual has been printed (May or June). If you need additional copies, request from Janelle.Loney@iowa.gov. USDA Team Nutrition has developed an info graphic for the CACFP and three new meal pattern training worksheets on yogurt, cereal, and milk (click here). Be sure to contact Janelle.Loney@iowa.gov if you have registered and must cancel. We still have waiting lists at most sites. For those who are not able to attend a live training, we plan to offer a webinar on the new meal pattern in July (date TBD). Information will be emailed when it becomes available. Massachusetts Children’s Access to Meal, Planned Smart offers a CACFP menu planning guide, standardized recipes and a video showcasing three different recipes (click here). This newsletter for CACFP participants is published by the Institute of Child Nutrition (ICN). 2017 issues are available by clicking here. Do not reply to this email. If you have questions, contact robin.holz@iowa.gov.